Our job is to find ways to capture on film the moments that make each couple’s wedding special and unique. Couples hire a Washington, DC, wedding photographer to tell their love story in pictures. The idea is to use photos to narrate the events of a wedding day without using words. That makes the inclusion of special and visually significant elements very critical. Those things make the story distinctive and personal. They signal that the marriage celebration depicted belongs to the two people featured, and not just any couple. As DC wedding photographers, we therefore understand why and appreciate when brides and grooms incorporate such elements into nuptials. The little rituals that people tying the knot include in their marriage ceremonies and wedding receptions make for great photography. They are impactful and meaningful ways to illustrate wordlessly the feelings they have for one another. In other cases, those elements are beautiful visual representations of the bonds brides and grooms forge between their families. Great examples of the latter are the rituals that some couples weave into their wedding ceremony. The main focus of that part of a wedding day is obviously the formal uniting of the two people getting married. Everyone is there to see the spouses-to-be exchange the vows and rings that bond them together for life. Sometimes, however, other portions of their time at the altar are devoted to commemorating the unification of their broader families. For instance, some Washington brides and grooms choose to alternate pouring sands of two different colors into one big jar. One color naturally represents the bride’s side, and the other the groom’s. The resulting distinct layers in the new receptacle are a great depiction of how a wedding unites two families. They become one new whole while still retaining their distinct personalities. The lighting of a unity candle achieves a very similar purpose. Two individual flames become one larger, more powerful one. A third example of this kind of tradition is the putting of three pegs into a unity cross. 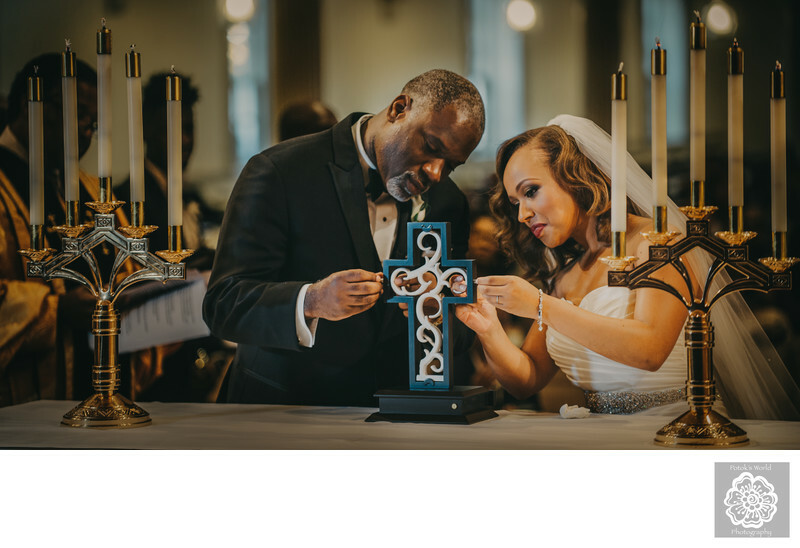 As part of the process of tying the knot, a couple will each take a cross to the altar. The DC bride and groom will then jointly fit one inside the other. Next, they take three pegs and use them to secure the inner cross to the the outer one. Those bolts are meant to signify the Father, the Son and the Holy Ghost. That those elements secure the two crosses together symbolizes the way that faith helps anchor and sustain the marriage. As you can see in this image, the ritual makes for a powerful and impactful photograph. The newlyweds in this picture chose to make this rite a part of their nuptials at the University of Maryland. Though technically outside of Washington’s city limits, that institution of higher learning is still in the DC metro area. And any resident of the Nation’s Capital will tell you it is very much a Washington institution! It is one of the best-known universities in the area and a big part of its culture. For that reason, many of its graduates still live nearby. Not surprisingly, a lot of them choose to come back to their alma mater to celebrate their matrimonies. Though the University of Maryland has a special significance for its alums, it is a great choice for any couple. The facilities are fantastic, and the location (just outside of DC) cannot be beat. This particular pair of newlyweds said, “I do,” in the very spacious UMD Memorial Chapel. That house of worship is a non-denominational church with a high vaulted ceiling and enough seating for 1000 guests. After the exchange of vows, the couple, their wedding party, their families and the other invitees migrated across campus. They then reconvened at the Samuel Riggs IV Alumni Center for their dinner and wedding reception. That locale offered a first-rate staff ready to cater to the couple’s every need. It also provided an elegant setting for newlyweds and their guests to dine and celebrate the big day in style. Location: UMD Memorial Chapel, 7600 Baltimore Ave, College Park, MD 20740.